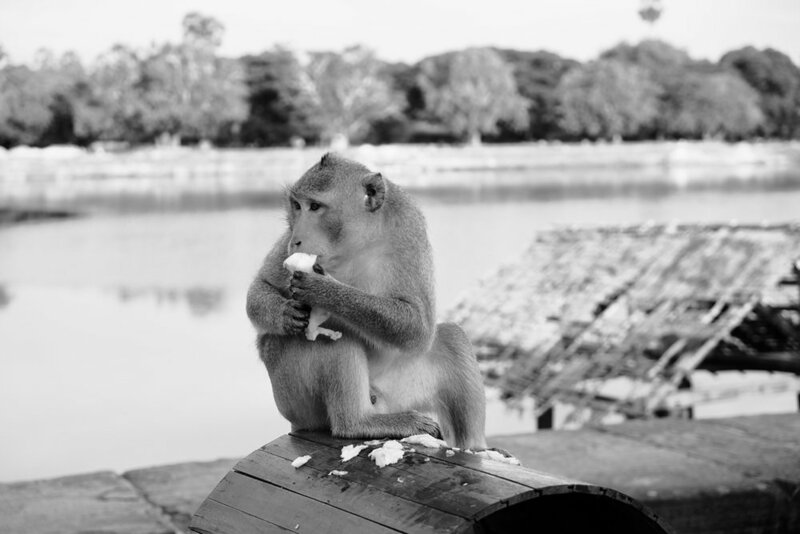 This blog post is a little different to the previous ones from our trip; if you want to read about what we did each day that information is at the bottom of this post, but I am combining our 3 days in Siem Reap in one post. 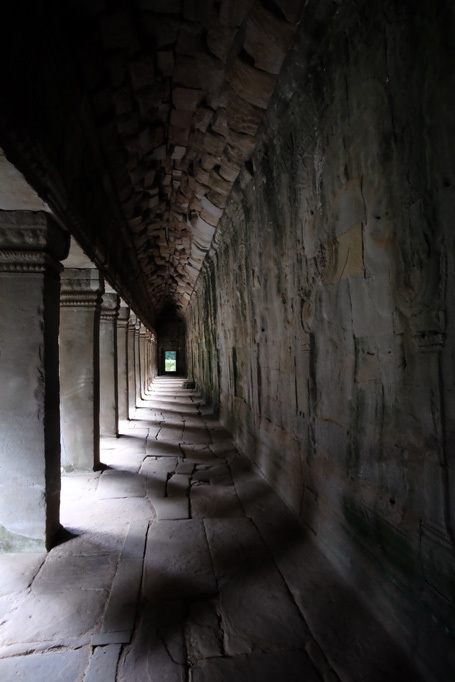 This post is mainly about photos of the stunning Angkor Archaeological Park ( which I refer to as Angkor in this post ), which we spent three days looking around, but only scratched the surface of the things to see. And remember that these photo are straight of the camera and not processed in any way , so apologies if a few of them are not level, or a little dark or bright. We were up at 4am and downstairs to meet Dom our tuk tuk driver at 4:30am. Our breakfast box that we had been promised by the hotel was nowhere to be seen, so we will have to get something later. Into the tuk tuk and we headed east through the new part of town to the Angkor Archaeological Offices, and into the lobby to buy tickets to access the temples. We joined the queue for the 3 day pass ( each ticket type ( 1 day, 3 day or 7 day ) has it's own queueing area ). We had to wait a few minutes for the ticket booths to open at 5am, and then after having our photos taken we got our 3 day passes for US$62 ea (which includes a donation to a childrens charity ). The 1 day pass was US$37 and the 7 day pass was US$72. The pass gives access to all the temples in the Archaeological Zone. Back to the tuk tuk and off to Angkor Wat, via the main road from Siem Reap ( there are 3 roads that get used by the tuk tuk drivers to get out to the temples from Siem Reap, the main / old one ( Charles de Gaulle ) was the prettiest ). We arrived at the entry for Angkor Wat at 5:15am ( after a brief stop at the ticket checkers on the side of the road as we entered the zone ), showed our tickets, and walked across the moat. The main bridge was being repaired at the moment so we are using a temporary pontoon bridge. Just to set the scene a little bit for Angkor; every temple, restaurant area, and tourist spot has lots of people asking if you want a guide book for US$1 with information about all the temples ( the one they show you is nicely printed, the copy you get in a plastic wrap is a cheap photocopy ), people asking if you want a guide, people selling trinkets ( normally quite aggressively ) and young children selling postcards, badges etc. After a while we found ourselves saying 'no' to these people without even listening to what they wanted. It becomes a reflex action whenever someone says " Excuse me Sir... " or "Where are you from... ". It does become a bit annoying after the 4th or 5th temple of being harassed, but it made us appreciate the couple of temples that we got to early before the hawkers had got going for the day, and we were greeted with peace and quite as we approached the temples. And it was a small price to pay for the sights we were able to see. Generally the guards did a good job of keeping the hawkers out of the temples themselves, but a couple of times the guards would 'helpfully' show us to a hidden spot in the temple ( like a small temple or photo spot ) and then want money for their help, so we started to view them as hawkers as well. It was also interesting to watch the types of people that got targeted by the hawkers; I noticed that European looking people were asked once or twice if they wanted to buy something, whereas Japanese and Korean looking people were harassed much more aggressively, and often the person being harassed would give in after a few minutes. Anyway back to the temples. 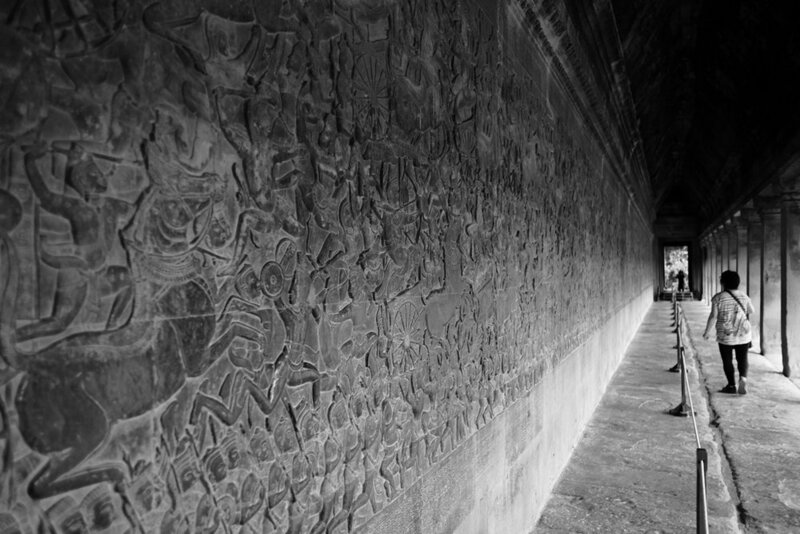 So into the Angkor Wat complex we went in the dark, with a small stream of people around us. After crossing the moat we entered through the main doors in the outer wall and into the massive open area with the main temple in the distance. We walked down the the walkway then I headed right to the South Reflecting Pool (SRP) and Liz when left to the North Reflecting Pool (NRP). The 2 reflecting pools are about the same size and in the same location either side of the central approach to the temple, but most people looking for the iconic Angkor Wat photo at sunrise head to the NRP as this is the one that always has water in it, whereas the SRP dries up if there hasn't been any rain. Given that we were in the wet season I new there would be water in both so I was happy to go to the less crowded SRP to shoot the sunrise. I found my spot and waited and shot as the sun lit up the clouds behind the temple, and then when it was clear that we weren't going to see the sun in a hurry I headed over and found Liz at about 6am. 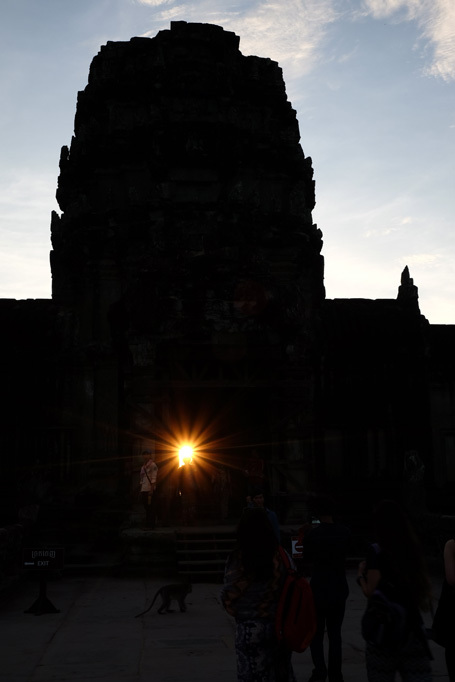 There were probably about 200 people at Angkor Wat for sunrise this morning, which is quiet compared the busy season of Dec / Jan / Feb apparently. We walked into the temple itself and walked around the vast complex of courtyards and corridors, and having decided not to wait in a queue to go to the very top of the temple we left at about 7am and walked over to the area where the shops and cafes were located, next to the NRP. We had breakfast ( pancakes and coffees ) and then looked through the South Library building, then headed out and back across the moat to our tuk tuk ( Dom was having a snooze in the hammock that they all carry with them ). We were doing the small loop of temples today so off we headed. We headed out from the Angkor Wat carpark and north to enter Angkor Thom through the South Gate, and parked up next to the main entrance to Bayon, on it's east side. This temple is best know for the many large faces carved on the sides of the temple. Dom agreed to meet us about 500m away at the market / food area which we could see in the distance. 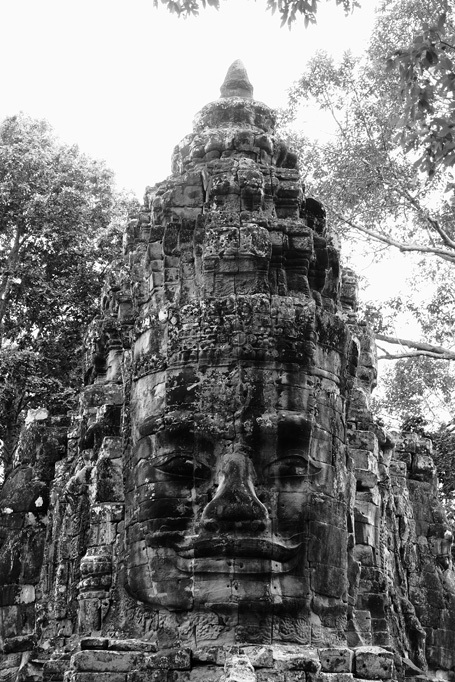 We went into Bayon and wandered through it's maze of corridor and hidden little courtyards and then up to the upper level where most of the faces can be seen. The temple was quite busy even at 7:30am, and we walked around for a while then headed out through the north gate of the temple. We followed the recommended route across the road and then along a raised walkway that lead to Baphuon Temple. On the way we passed a couple of groups of gardeners / sweepers who appeared to be employed by the company that runs the temples ( Apsara ), and it is good to see that they want to keep the area as clean and tidy as possible. It also seems that the people that they employ are the same people that live in the villages around the temples which is good to see as well. We walked up and around Baphuan Temple and then walked through a small gate in the wall and through the bush and trees to Pimeanakas Temple ( which we couldn't climb due to repair work ) and then out the east side of the walled complex around Pimeanakas, and onto the Terrace of Elephants. 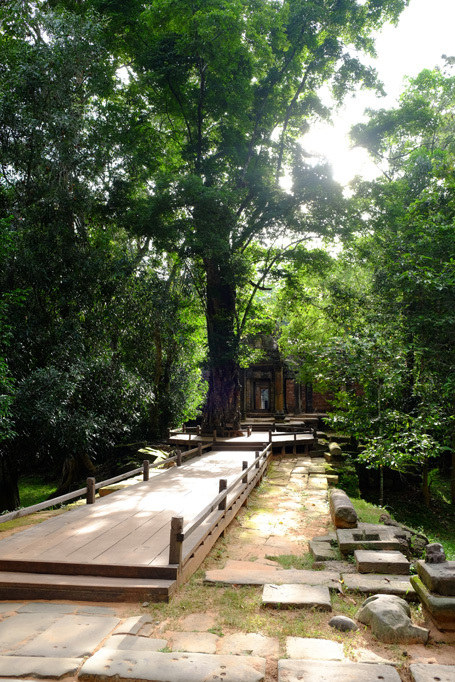 This terrace / walkway looks out over an open area in the forest in the centre of Angkor Thom, and also looks out to some small temples dotted around the grass area. Angkor Thom was once a vast city with an enclosing wall and moat, with the Bayon Temple at it's centre and the Royal Palace / Pimeanakas Temple just to the north. Presumably the whole inside of the enclosing wall of Angkor Thom was once free from the forest and was filled with houses and buildings which, being made of wood, are now long gone. After exploring the north end of the Terrace of Elephants we grabbed a cold drink from a man in a van with a big chilly bin, and sat in the shade of a tree. While we were there the 'ice truck' arrived with replacement ice and cooling pads for our man with the chilly bin. We found Dom again at 9:30am ( although it feels like it should be nearly lunch time after our early start ) and we headed off again, out through the East Gate of Angkor Thom ( we stopped briefly to take some photos ), to a pair of temples about 300m past the gate. These temples ( Chau Say Tavoda and Thommanon ) mirror each other on either side of the road, although Thommanon, on the north side of the road, is in the better condition of the two. We wandered around these temples avoiding the sun which was now beating down, and also avoiding the selfie takers but helping the people who wanted their photos taken. Back to the tuk tuk and on to the next stop on our small loop: Ta Keo. We didn't stop here for long; the temple was under reconstruction and we were also starting to feel the legendary temple fatigue after having visited 6 temples already this morning. We walked up to the first level and walked around, but didn't climb any further. 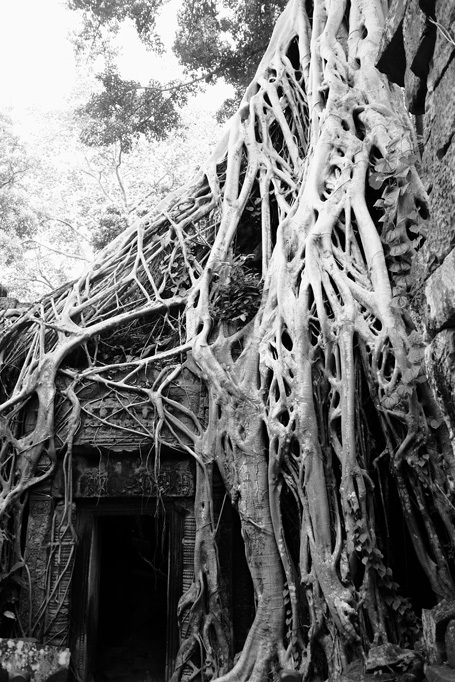 So back to the tuk tuk and on to a temple that we were both looking forward to: Ta Prohm. As soon as we walked in through the gate in the outer wall of Ta Prohm, at 10:30am, we landed in the middle of 2 large tour parties with their guides. We tried to get ahead of them and walked off down the long roadway to the temple itself, but unfortunately encountered another tour party just entering the temple. We battled our way around the temple, waiting as required to get photos without other people in them, but ultimately it was not a good experience being in among so many people ( there was even a put of pushing and shoving involved at a few doorways with people trying to keep up with their tour leaders ), so we decided to get through as quick as we could and come back early on Day 3 when we could hopefully get ahead of the crowds. 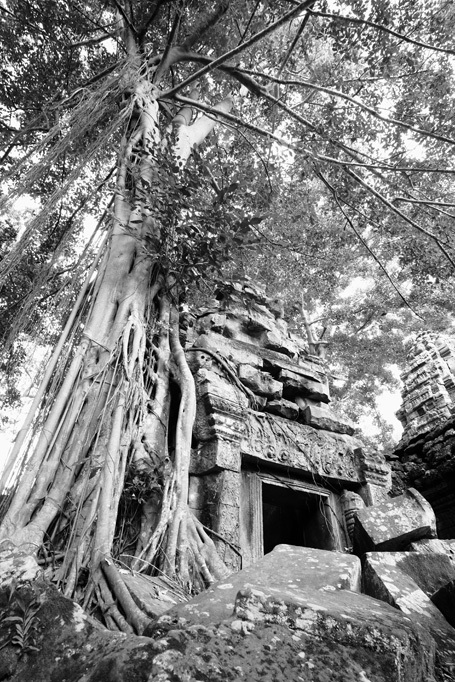 Despite the crowds Ta Prohm is a very different feeling temple being largely shaded by the trees that have grown inside and on the walls. We exited the complex, at 11:30am at the opposite end to where we entered, and found Dom in his hammock again. Off to the next temple on the loop which was Banteay Kdei. Despite this being temple No 9 for the morning, and it being hot, and this being the last temple to visit on the small loop, it was one of my favourites for the day. 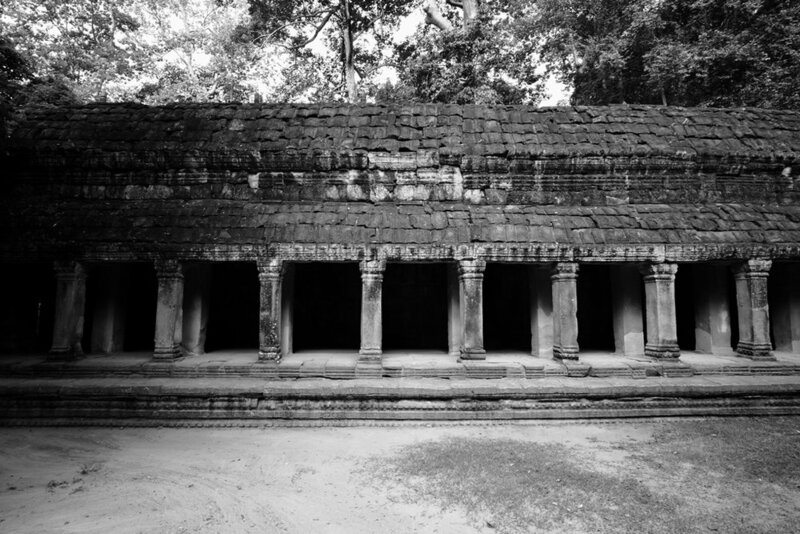 After the chaos at Ta Prohm we pretty much had Banteay Kwei to ourselves. This was another temple ( like Ta Prohm ) which is designed on a long east west walkway running right through the temple, with a small shrine right in the centre. We walked right through the centre of the temple and then walked around the outside of the temple to get back to the entrance on the east side where we entered. We then wandered over the road and had a look at Srah Srang which is a rectangular man made lake or baray. Back into the tuk tuk and we headed back into Siem Reap at 12:45pm. We were a bit weary after walking a few kilometres through temples on our 7 hour tour, so we grabbed some lunch at a restaurant in town then went back to the hotel for a swim, and relaxed. At 4:30pm Dom picked us up again and we headed to Phnom Bakheng, which is a temple located on top of a small hill ( in Cambodia where everything is flat any hill is significant ). We walked up the track to the top of the hill ( about a 20 minute walk ) and then waited for a bit in the queue at the bottom of the temple steps. Due to overcrowding at this temple in previous years they now limit the numbers on the temple to 300 at any time. And as most people were heading up for the sunset, the passes for the temple were in high demand. After about 15 minutes we got to the front of the queue and got our pass to go up the steps to the top. We had a walk around on the flat top of the temple then found a spot to watch the sun sink. There was a lot of cloud around so we weren't expecting much from the sunset, the sun disappeared behind clouds before it hit the horizon and then nothing much happened after that. We waited as long we were able to before being kicked off the temple ( it was a bit strange that the temple is promoted as a sunset watching location, with sunset normally around 6, and to then close the temple and start kicking people off at 6, just when sunset is happening ). We walked off the temple at 6:15pm then back down the hill in the dark, back to Dom and he took us back to the hotel at 6:30pm. We went for tea to Red Piano and then back to the hotel for bed. A long but amazing day travelling around some stunning temples. 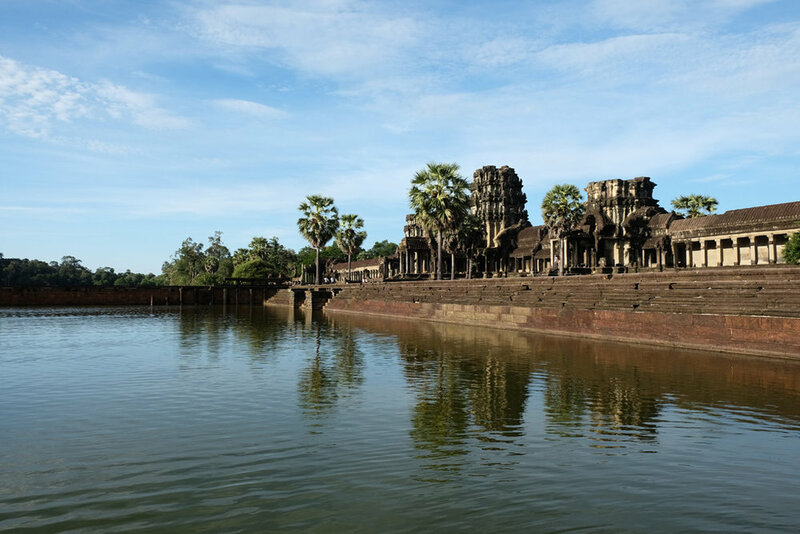 As one description of the Angkor area said, each of the temples we saw today on their own would be a major tourist attraction, but to have them within a short distance of each made the whole place more special. And I enjoyed the drive between the temples as much as the temples themselves; beautiful forests with monkeys and oxen on the sides of the roads, glimpses of smaller temples in the forests, and the constant call of birds. OK, lets do it again on Day 2. We had a slight sleep in until 4:30am, then downstairs to meet Dom at 5am. 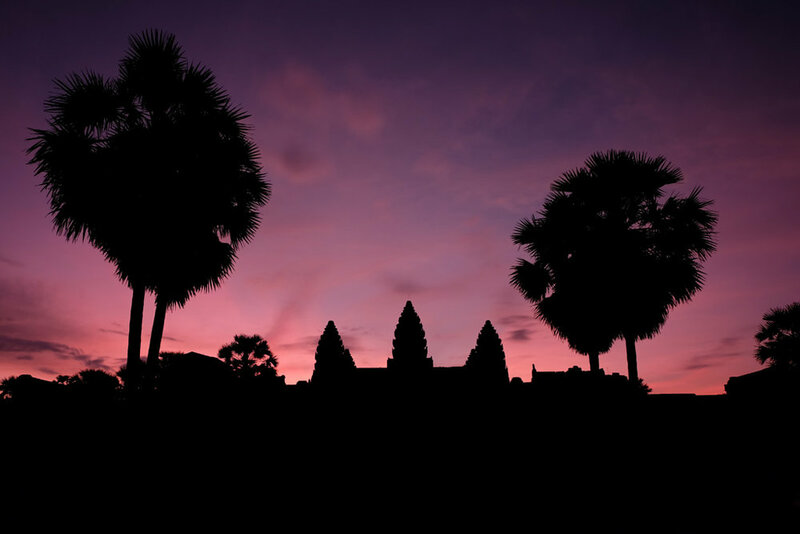 Again we headed to Angkor Wat to shoot the sunrise. This time Liz headed to the SRP and I stayed in the middle of the walkway which leads to the temple. I pretty much had the area to myself until people started to walk up to the temple after sunrise. We grabbed some breakfast at a cafe by the NRP then headed back to the tuk tuk at 6:50am to start the large loop of temples. 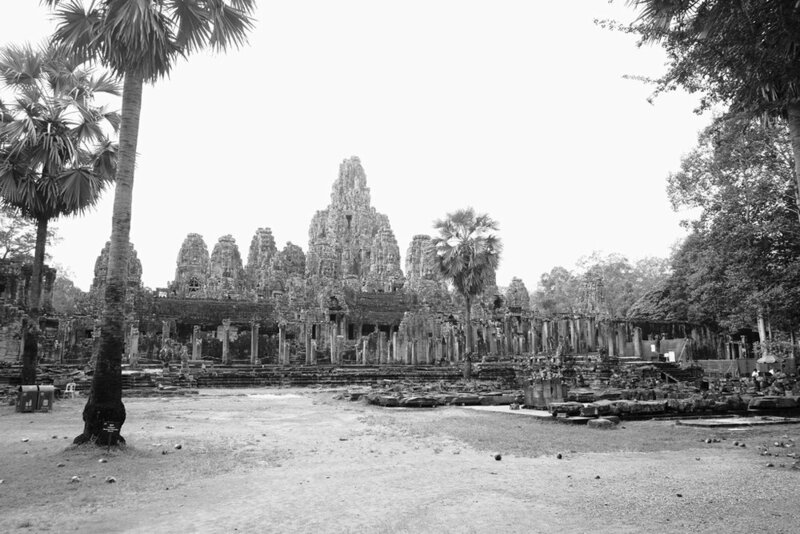 Again we headed through Angkor Thom, but this time we exited by the North Gate to start the large loop of temples. Our first stop was Prasat Preah Khan. We had to wait a few minutes for it to open at 7:30am so we were chatting to the other early risers who were also waiting to get in ( and we kept seeing the same people all the way around our loop today ). Once it opened we walked the short distance from the entrance to the temple ( Preah Khan is another walk through type of temple with everything aligned down the central corridor ) and then we walked through. Again a stunning series of rooms with amazing detail in the carvings. And as an added bonus for photography the sun was starting to shine into some of the rooms to add a warm glow to the stonework. And there were only few people around too. We walked out the east gate of Preah Khan ( we entered through the west ), and had a look out over the Jayatataka Baray. This baray is obviously very shallow and has trees growing in it, but most of the trees look dead, so growing may not be the right word. We jumped back in the tuk tuk and headed to our next temple: Neak Pean. This water based temple is located on an island in the middle of Jayatataka Baray, and is accessed across a 300m long wooden boardwalk across the lake. Again we had arrived before the hawkers had set up so it was a very peaceful walk across to the island. The temple itself was a bit hard to take it as it consists of a series of 4 pools with a central sculpture and we could only access one end of one of the pools so we couldn't see any of the sculptures up close. We had a brief chat to the guard who was holding onto a baby that belonged to a nearby sweeper / cleaner, and given that they both lived in a village just to the side of the temple the baby was probably her niece anyway. We walked back to the shore at 8:30am and headed to Ta Som temple. 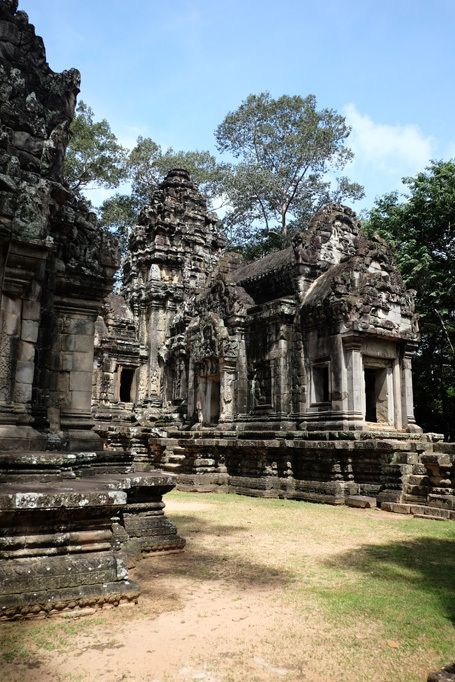 This temple is located at the east end of the Jayatataka Baray, at the opposite end to Prasat Preah Khan. We had a wander through this small temple then back to the tuk tuk and onwards to the next one. We are a bit fussy about where we spend our time and this temple was nothing special ( in comparison to the others we had seen ). We had been advised by someone we bumped into at East Mebon that the easy way to climb this temple was by the wooden steps on the south face, and not by the large stone staircase inside the entrance on the east side. So we found the easy steps and climbed up to the large area on the top of the temple. We had a look around and then headed back down ( we were planning to come back for sunset and sunrise so we would have plenty more time to explore this temple ) and got back in the tuk tuk at 9:40am. Again we were pretty weary by this stage so we headed back to the hotel and gave Dom the rest of the morning and afternoon off. We rested, had a swim, slept a little, had some lunch at Tout les Jous across the road from the hotel, had a walk around town, rested a bit more. I managed to slip at the bottom of the stairs to the bathroom area in our hotel room and bruised my arms and feet a bit, so I was then confined to the safety of bed for a bit. Dom arrived for us again at 4:30pm and we headed back to Prae Ruup which, along with Phnom Bakheng, were the only 2 temples open for sunset. Most others closed at 5pm or 5:30pm in the case of Angkor Wat. We climbed up to the top and waited with about 50 others for sunset, which again wasn't great due to the amount of cloud around the horizon, and then we headed back to the tuk tuk at 6:15pm. Dom took us on a detour on the way back to the hotel, down a new road which leads from the eastern part of town to the eastern side of the temples, through the local market ( located out near the Angkor Archaeological offices where we bought our passes ), which was pumping with stalls, food outlets and fairground rides. The market seemed to be aimed at the locals as all the prices were in Riel and not US$, but there were a few white faces walking around. We headed back to the hotel through the modern part of town and arrived at 7pm. We went into town again for some dinner and then back to the hotel at 8pm. Tomorrow we plan to revisit a couple of temples early to beat the crowds. We were up again at 4:30am, and down for the tuk tuk at 5am, but Dom slept in and didn't arrive until 5:30am. This meant we missed the sunrise we were hoping to get at Prae Roup ( we did see it on the drive out to the temples and it was nice ). Nevermind. 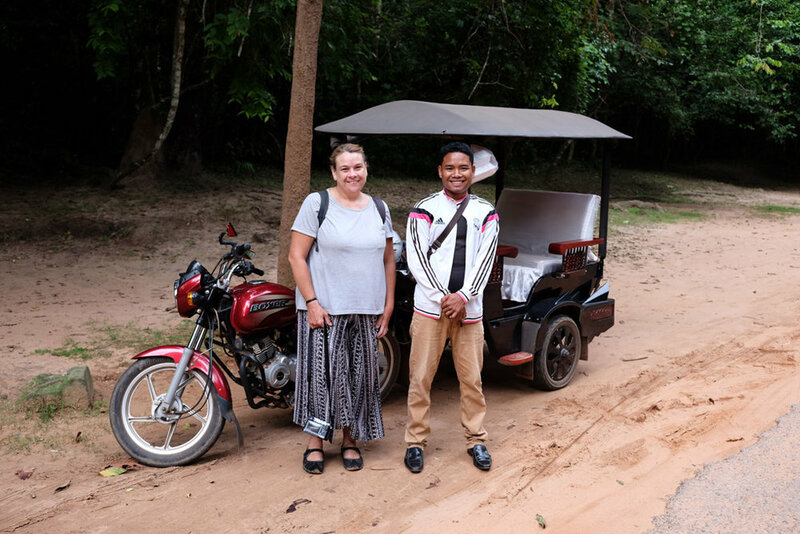 We had a wander around Prae Roup anyway and then jumped back into the tuk tuk and headed to the East / Victory Gate of Angkor Thom for another look. Dom showed us that you could walk up to the top of the wall that surrounds Angkor Thom, which as a road running along it, and gave a good viewpoint to look at the faces carved above the gate. We jumped back in the tuk tuk and went to Ta Prohm at 7am. The gates weren't due to open until 7:30am so we grabbed a drink at the only stall that was open this early and ate some of our breakfast from the box that the hotel had provided for us today for the first time. I also bought a small 3-headed elephant figurine that we had been looking for since Laos. When the western gates opened at 7:30am we walked in with 5 other people ( a far cry from the hordes we had encountered on our first visit ) and we had a relaxed walk through the forest to the temple itself, and then around the temple. We discovered some areas that we had missed on our first visit ( in our hurry to get out ), so we had a good look around this stunning temple with it's massive trees. We walked back out to the eastern gates at 8:30am, and as we were walking along the path to the outer wall of the temple we met 3 tour tour groups heading in, so we were pretty happy with our timing. We headed back to the hotel at 9am, and spent the rest of the day resting, sleeping etc, and catching up with admin. We had lunch in town and a walk around some of the smaller streets and alleyways. 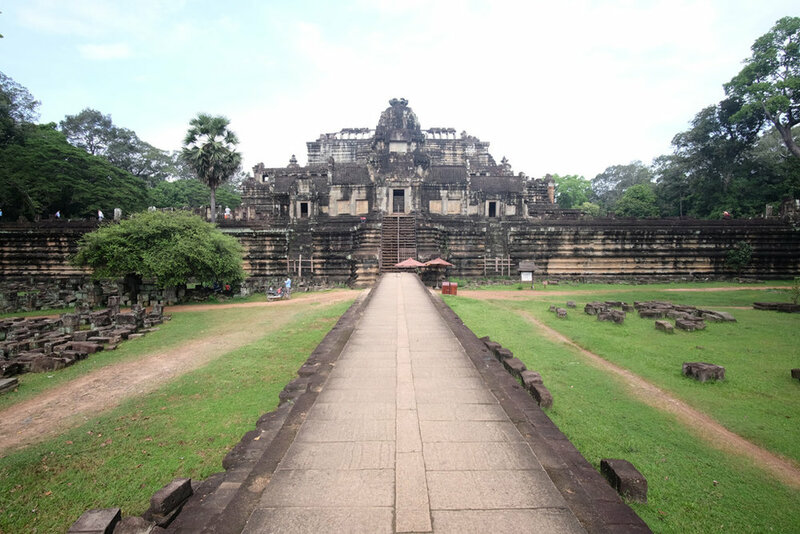 We have got used to Siem Reap and ( as long as you avoid the Saturday Night crowd ) it is a good base for the temples, with plenty of good restaurants and cafes. For sunset today we decided that we would head to Angkor Wat to catch the setting sun shining on the temple, and see how long we could stay past the 5:30pm closing time. So back on the tuk tuk at 4:30pm and off to Angkor Wat, headed in and found our spots ( Liz at the NRP and me at the SRP ). I got chatting to the people next to me who were there for 2 weeks from Belgium, and he was shooting with a Fujifilm camera as well so we chatted about gear and holidays as the sun sank behind us and lit up the temple. We got kicked out at 5:40pm ( at first the guards were polite, but they got more insistent the longer we stayed. We walked along the walkway and out through the gate just as the sun was setting and shining in through the doorway. We found Dom for the last time on our temple tour ( he was asleep again ) and went back to the hotel at 6:30pm. We went out for our last dinner in Cambodia ( Khmer Chicken Green Curry, Beef Lak Lok and 2 beers, US$11.50 / NZ$14 ) and headed back to the hotel to pack. So in summary we had an amazing, but tiring, 3 days in Angkor, and we were blown away by the scale of the temples and the whole area. My enduring memory however will be sitting in the tuk tuk on the the long straight roads through the jungle, with the sun shining through the trees. We will be back Angkor.